A team from The Cooper Union's Albert Nerken School of Engineering has won the top prize in the first-ever IEEE ComSoc Student Competion. Victor Chen, a senior, and Kyung Min Lee (EE'13) will share the $2000 award for submitting a project that provides a "unique solution to a real-world problem using engineering, technology, science, computing, and leadership skills to benefit the community or the world," according to the Institute of Electrical and Electronics Engineers Communications Society website. 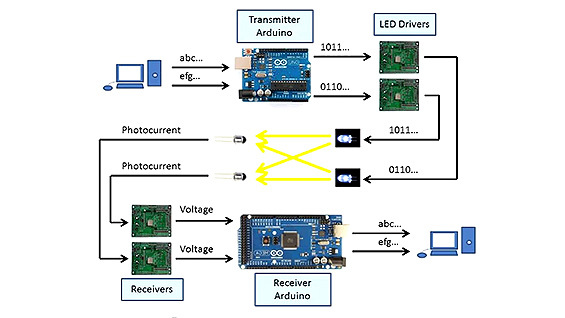 Their winning project entitled, "Multiple-Input Multiple-Output Optical Communication with Arduino (MOCA)," demonstrates a low-cost model of using LEDs to wirelessly transmit data using visible light. "We encode information by turning LEDs on and off, so fast that the eye cannot see them flicker, and we use photodiodes to receive the optical signals sent by the LEDs," Victor Chen says. In a video posted online he shows how, using the MOCA system, a repeated message gets transmitted from one computer to another using two LED lights. When he blocks the lights the message transmission ceases. 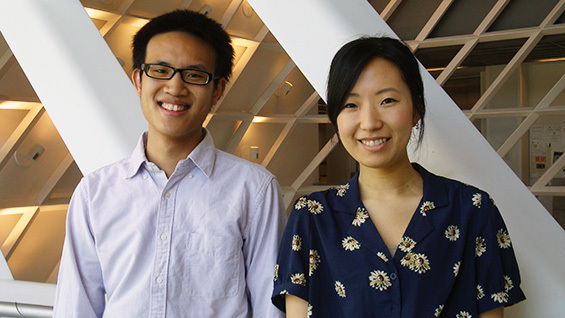 Visible Light Communications, or VLC, systems are not new, but Chen and Lee's project aims to expand the technology using Arduino, an inexpensive, open-source microcontroller. "We wanted to make the system inexpensive and scalable so more students and researchers have access to a VLC platform that can be modified to meet their specific design goals," Kyung Min Lee says. "Many VLC systems use expensive hardware for signal processing, and with multiple channels it becomes quite costly.” They hope that an affordable platform like MOCA will attract more attention to VLC systems so the technology can be developed further to be put into a practical use. "Victor Chen and Kyung Min Lee's clever mix of software and electronic circuit design smartly brings together cutting edge technologies of MIMO and optical communications," Sam Keene, Assistant Professor of Electrical Engineering says. 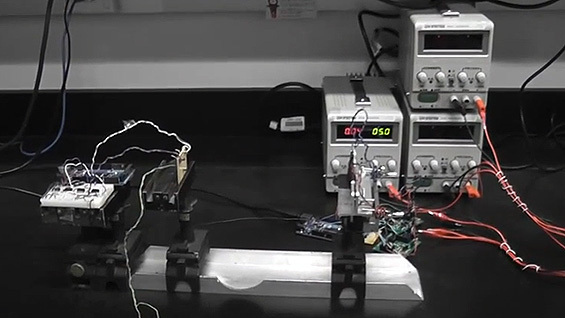 "The project can easily be replicated as both a pedagogical tool to introduce students to optical communications, or as the foundation for an inexpensive testbed for research purposes,.” The MOCA system was originally developed as Chen and Lee's senior project ('12-'13 academic year) with Prof. Keene and Prof. Toby Cumberbatch co-advising. Chen and Lee see a lot of potential in the technology. "When you replace light bulbs with LEDs, you save a lot of energy and money. When you put data on these LEDs, your light switch becomes your internet access," Chen says. The designers see other advantages as well. Since light does not travel through walls, the data in one room cannot be "eavesdropped" by someone next door, they say. Also, due to the extremely high frequencies of visible light, in a given time period VLC can theoretically transmit much larger quantities of data than WiFi, which relies on the narrower range of radio frequencies. At the moment the MOCA technology is in its infancy. Current speeds are just one megabit per second with a broadcast distance of only 15 inches. But Chen and Lee continue to work at it. "The future is to improve the speed and link distance. We wanted to demonstrate that VLC systems can be scaled up and built for as little as $100. So this technology is easily achievable." Chen says.